This product requires the base game Assassin's Creed Odyssey. 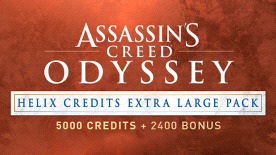 This credit pack contains 5000 Helix Credits. Gain 2400 extra credits for a total of 7400 Helix Credits! Helix Credits can be used to unlock extra items, in-game currency, resources and more.